In a huge departure from the women I usually write about, I’d like to introduce our readers to a woman who practiced the ancient discipline of yoga. Yoga was the domain of men from its inception. The earliest visual evidence of yoga comes from about 2500 BC. Men were the teachers and practitioners of yoga from that point until the early 20th C. And then, it took a persistent and assertive woman to break the barrier. Eugenie Peterson was born in Riga, Latvia on May 12, 1899. Her father was Vasili Peterson, a Swedish bank director and her mother was Alejandra Vasilyevna, a Russian noblewoman who worked as a theater actress under the name Labunskaia. Eugenie was to go to school in Petrograd and then went to study theater in Moscow. When she was fifteen, she came across a book “Fourteen Lessons in Yogi Philosophy and Oriental Occultism” by Yogi Ramacharaka née William Walker Atkinson (1862-1932). Ramacharaka was an American attorney who left his practice to join the religious New Thought movement at the turn of the century. She also read a book by the poet-philosopher Rabindranath Tagore. Eugenie became so excited reading these books; she vowed to go to India someday. After the Russian Revolution of 1917, there was brutal civil war. Eugenie fled to Latvia, then Poland and ended up in Berlin in 1921. Because she was a trained actress and dancer she joined a theatre troupe and traveled all over Europe. In 1926, she learned there was an upcoming congress of Annie Besant’s Theosophical Society in Ommen, Holland and decided to go there. One evening at the congress, she heard the renowned yoga master, poet and philosopher Jiddu Krishnamurti chanting in ancient Sanskrit. She was instantly moved. She was to say later her time at the congress changed her life. In 1927, Hermann Bolm, a wealthy banker asked her to marry him. She agreed if with the caveat that he pay for a trip to India for her before they were married. He agreed and she spent three months in India. When she came back, she returned the engagement ring, telling Bolm her place was in India. She sold what jewels and furs she had and returned to India. Under the stage name of Indra Devi, she became a rising star as a dancer and actress in Indian films. During a social gathering, she met Jan Strakaty, the commercial attaché to the Czechoslovak Consulate in Bombay. They were married in 1930. Through him she met the Maharaja and Maharini of Mysore, who maintained a yoga school in their palace where Sri Tirumalai Krishnamacharya taught. Indra became a colonial socialite attending receptions, balls, and horse races. She tried to meet Indians of all castes and ranges. She became friends with Mahatma Gandhi, Rabindranath Tagore and Jawaharlal Nehru. Her husband was very open and understanding, even though she was violating social convention. This lifestyle soon took its toll on her and she began experiencing chest pains. She spent four years taking unsuccessful treatments for her condition. A yoga practicing friend of hers suggested she try practicing yoga. She approached Krishnamacharya. He refused on the grounds she was a Westerner and a woman. The Maharaja finally intervened and Krishnamacharya agreed to take her on as a student. She met every challenge: strict discipline, long hours of practice, diet restrictions, no use of a stove to keep warm. She had to keep up with all the requirements of the male students. The master admired her zeal so much he took her on as a private student. Some of her fellow students were to become the great masters: K. Pattabi Jois and B.K.S. Iyengar. She experienced a complete recovery from her heart ailment. In 1938, her husband learned he would be transferred to China. Krishnamacharya urged Indra to teach yoga. In 1939, she opened a yoga school in Shanghai in the home of Madame Chiang Kai-shek, wife of the nationalist leader and a yoga enthusiast. She had American and Russians students come to her school. They began calling her “Mataji” which means mother. Indra returned to India after the war and wrote her first book “Yoga, the Art of Reaching Health and Happiness”, believed to be the first book on yoga written by a Westerner to be published in India. 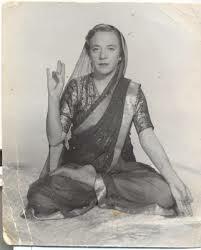 She was also the first Westerner to teach yoga in India. In the meantime, her husband returned to Czechoslovakia where he died in 1946. Indra departed for Shanghai to retrieve her belongings and couldn’t decide whether to go back to India or go to the United States. Her decision was to go to the United States. About a year later she opened a yoga school in Hollywood. In an effort to publicize and spread word about yoga, she cultivated movie stars and other famous people to come to her school. Gloria Swanson, Yehudi Menuhin, Pandit Nehru, Ben Gurion, Roman Navarro, Jennifer Jones, Greta Garbo and Robert Ryan were just some of her students. 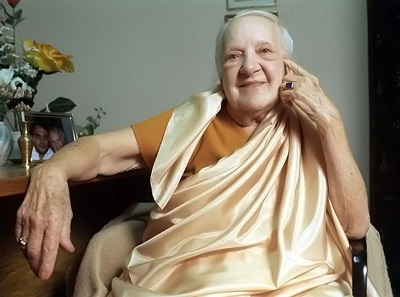 She became friends with Elizabeth Arden, the expert cosmetologist who incorporated yoga into her health spa programs. Indra wrote two more books, “Forever Young, Forever Healthy” and “Renew Your Life by Practicing Yoga” which soon became best sellers. They were sold in 29 countries and translated into ten different languages. In 1953, she married Dr. Sigfrid Knauer, a distinguished physician and humanist. She became an American citizen in the mid-fifties and her name officially became Indra Devi when she put it on her passport. Dr. Knauer bought her a twenty-four room estate in Tecate, Mexico where she gave training courses in yoga. She began speaking at conferences and on television and radio to spread word about the benefits of yoga and writing more books. She went to the Soviet Union in 1960 and tried to convince the government that yoga was not a religion and should be practiced there. It was finally legalized in Russia. In 1966, she became a follower of Sathya Sai Baba. She began calling her yoga Sai Yoga. In 1977, Indra’s husband died. She was traveling the world lecturing and teaching, aided by her fluency in five languages: English, Spanish, Russian, French and German. In 1982, she travelled to Argentina and fell in love with the country. Her popularity was immense and she was to spend the rest of her life there. In 1988, she created the Fundacion Indra Devi which exists to this day. In 1989, the first national conference was held in Russia with Indra Devi, B.K.S. Iyengar and Guru Bhajan. In 1999, over 3,000 guests attended a party celebrating her 100th birthday. As she became older she still traveled but began to slow her pace. In 2002, her health was to worsen and she was to die peacefully in Buenos Aires on April 25, 2002. She was cremated and her ashes scattered over the Rio de la Plata. Susan, I am taking a yoga teacher training course and am writing an essay about Indra Devi (who is somewhat of a heroine of mine). Your biography of her is by far the very best I have read. What are the sources you used? What must if have been like to take classes at the house of chiang kai-shek? What was her influence on chinese politics if any. What relationship did she maintain with Madam Chiang Kai-shek after she left China? What was her retreat in Mexico like? How is it used today? What is her foundation in Argentina like. Who are the yogis who were directly influenced by her? What about her influence in California among the stars? What must she have been like then? What influence did she have on Hollywood? What a fantastic blog, Susan, I can’t wait to dig into it! Sarah: Thank you for your kind comments. I have sent you an e-mail with answers to your questions. Let me know if you have more. Susan A.
I can certainly attest to the fact of Yoga in the early twentieth century being mostly male dominated. I grew up with male instructor of Yoga who showed up on TV. Can not remember the name but it was considered strange and hippieish. Anyway I did not like the fact she used her fiance to get her trip to India financed. Unless she really truthfully fell out of love with the man. Great article, very informative. Another interesting story. An early trailblazer who helped popularize yoga. Great! I practice yoga too (can’t say I’m a great expert, but still). In fact, I’ll soon have to be off to yoga class. 🙂 Thanks for the post! Thanks Nora. I’m finding out many of my interenet friends practice yoga. Keep practicing! Wow she led a full life! Good post. I’ve never heard of her. Thanks for the info! Thanks Susan! There’s no reason women can’t teach yoga. She did it with panache! Thanks writecrites! I’ve been practicing for 15 years. It’s been one of the best things I’ve ever done for myself. What kind of yoga do you practice? I’ve tried a few times and haven’t found anything yet that works for me, but I really want to. Nicole: Thanks for reading and I’m glad you asked that question. After four years of trying different types of yoga, a new Iyengar yoga school opened near my house. I have been practicing there for 11 years. It is the best style of yoga. It’s very alignment based and therapeutics are very important. The use of props helps in getting into the asanas. I highly recommend Iyengar yoga. Mr. Iyengar was a student with Indra Devi at the Krishnamacharya school in Mysore, India. Good luck finding the right yoga style. Good for you Trix! I find that any yoga is good yoga. Especially if it helps with challenges of the body. Keep it up! Fascinating. I must get back to yoga.